Another successful year for the London Indian Film Festival (LIFF), with a great collection of films all vying for the ultimate accolade, to be crowned the audience’s favourite movie. Despite some stiff competition, the winner of the Audience Award for Best Film at the festival was Eaten by Lions – a British comedy about two half-brothers who are brought up by their grandma, after their parents are accidentally killed by lions in a safari park. Set in Bradford, the story then follows the aftermath of their Gran’s sudden death which leaves the teenagers looking for family to take them in. The director of Eaten by Lions, Jason Wingard said, “We’re delighted to win this fantastic award. Eaten By Lions is a modern, relevant comedy dealing with contemporary issues such as diversity and disability, but ultimately captures that life is about relationships and people, and we’re so pleased audiences are connecting with it. It was fantastic to work with some of Britain’s best-loved comedians, who all bought emotional heart and humour to the story”. The closing night in London also saw the announcement of the winner of the Satyajit Ray Short Film Award, supported by the Bagri Foundation, as being The Peanut Seller – a story which the judges found to be cinematically well crafted, telling a powerful humanist story of a lost child. Etienne Sievers, who wrote and directed the short film, won £1,000 and sees the win as a huge encouragement to continue making films that address important social issues “in an authentic, aesthetic, and engaging way”. Other special awards presented by the festival included two Sunmark Pure Heaven ICON Awards, which went to two acclaimed actors from India, Irrfan Khan and Manoj Bajpayee. Irrfan Khan had two films showing this year at LIFF; Mostafa Sarwar Farooki’s Doob (No Bed of Roses), and Anup Singh’s Song of Scorpions. Coincidentally, Manoj Bajpayee also appeared in two of this year’s movies; Tabrez Noorani’s Love Sonia and Dipesh Jain’s In The Shadows (Gali Guliyan). Bajpayee felt honoured by the award and said, “An actor is always in the making, it’s a process that one follows, and getting this honour at the festival is quite remarkable. This being a festival of Indian sub-continental independent films – these I feel, are films that often do complete justice to the medium of cinema, where creativity is at its peak. Getting this award at this prestigious film festival, it definitely is a matter of privilege for me, also in London, the city I love the most”. 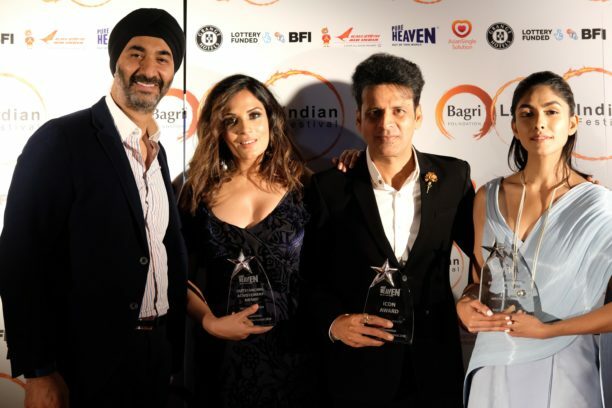 Also awarded were the Outstanding Achievement Award, which went to Richa Chadha (Anuraq Kashyap’s Gangs of Wasseypur and Love Sonia), and the Best Newcomer Award, which went to Mrunal Thakur (Love Sonia), again both sponsored by Sunmark. Chadha explained how winning meant a lot to her because it was an international award. “Very few festivals celebrate diversity from India. When you say Indian films, people assume it’s just Bollywood and that’s untrue. We have independent films, that survive the onslaught of the nexus, and festivals like LIFF help us in making the right noise back home, so these films stand a chance against the mainstream expensive spectacle films,” she said.